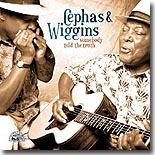 If you’re a fan of Piedmont blues, then chances are that Cephas & Wiggins are a household name. With John Cephas’ warm, round voice and clean, efficient acoustic picking and Phil Wiggins’ churning harmonica and deep, gruff voice, this duo is the closest our era comes to the great Sonny Terry & Brownie McGhee. There are differences, though, and they initially leave the listener wanting for more. Cephas and Wiggins very rarely emphasize bravura performances, choosing to deliver their music with good taste and polished professionalism, not with flashy showmanship or blazing solos. But the more you listen to them, the more you get drawn in by the coziness of their music, which feels so natural that you never really feel that these guys are actually working or that they released this stuff in order to achieve what you’re hearing. And you start noticing the little things: the seamless way that Cephas goes in and out of a solo, the slow accelerations in Wiggins’ blowing, the vocal harmonies that sound improvised and yet are just right for the material, and the sly humor (like the ad-libbed comments at the end of “Stack and the Devil,” a variation on the legend of Stack’o’Lee, that opens the duo’s latest, Somebody Told the Truth). Producer Joe Wilson has done a nice job of putting the voice high in the mix so you get every syllable, and yet not mask the delicate touch of Cephas’ guitar. The song selection is a nice mix of traditional tunes, original compositions (check out “Forgiveness,” which may recall Guy Davis’ ancient/modern thematic outlook) and a few covers (of these, Skip James’ “Sick Bed Blues” stands out). As a sort of bonus, although it makes for a jarring transition, there are two live cuts included, on which Wiggins was absent. “Reno Factory” is sung and played by Cephas solo, whereas on “Darkness on the Delta” he is acting as guest vocalist for a small jazz/blues band led by reclusive jazz legend Tal Farlow. Alligator doesn’t often release acoustic blues, but when it does, as this record demonstrates, it does so with as much savoir-faire as on its electric releases.